It’s been more than eight months since we last visited the Niagara wine region, and guiding our friends CBJ+M around seemed like a perfectly good excuse. Last weekend we decided to see what kind of fun we could get up to with thirty hours and an Autoshare Prius. 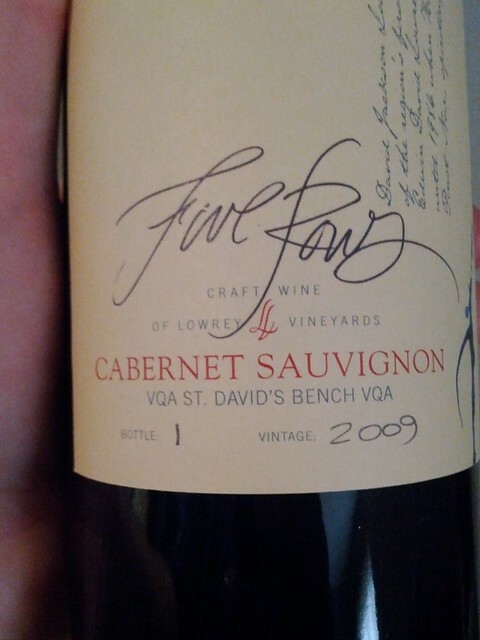 We decided to keep it to a very respectable five or six wineries per day (what? ), and give them a mix of small and large wineries. Within reason, mind you; we can’t deal with the crowds at Jackson Triggs or Inniskillin or what have you. We started with Southbrook, then did a tasting at Ravine before eating lunch there (next to Jason Spezza), then moved on to Five Rows and Colaneri. Five Rows (whose website I would link to except that it seems to be infected with malware) might have been the highlight of the whole trip. It was only our second time there, and it was as every bit good as the first. We had a great chat with Wilma Lowrey; we recounted our first visit and she told us no end of stories while pouring us wine. We learned the history of their labels (best: their ‘Single Press’ ice wine) and bought an 08 and 09 Cab Sauv. She actually gave us bottle #1 of the 09 (they hand-number the labels of all their bottles so customers can record them on their website) and we can’t wait for the day we’re able to open it up. After that stop we did a 180 and hit Colaneri, the palatial and showy winery a little further west. Sure, it looks like a Disney-fied Tuscan villa from the outside, but we’d heard they were making good wines lately. I thought the wine was okay, but the tasting room rammed with tourists (and Jason Spezza again!) was hard to deal with after the personal, intimate experience we’d had at Five Rows. Nice bathrooms though. We grabbed a bottle or two and moved on. Our penultimate stop was Kacaba, where they were happy to have interested, paying customers at the counter and not party-goers trying to scam multiple samples. Us, we left with a case. By this point we were running out of afternoon, so we zipped up to Vineland Estates to hit their tasting room. 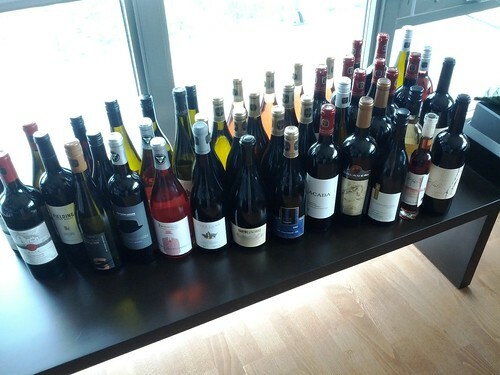 Again, we quickly became staff favourites for not asking bizarre questions or trying to scam free tastings. We delved into the Pinot family: Grigio, Blanc, Meunier. We figured that was enough wine for one day (we had 24 bottles already; guessing CBJ+M had about 10) so we drove the few clicks to Black Walnut Manor, our B&B. We were greeted warmly, taken to our rooms and prompted to come have wine and cheese and cantaloupe jam by the pool. So we did. We said hi to the other guests and played with their dogs and took long, cooling swims and felt pretty goddamn happy, thank you very much. For dinner that night we returned to Vineland Estates, and ate on their patio under that huge tree, overlooking the vines and trees and lake in the distance. I had east coast lobster bisque w/ vanilla chantilly; Upper Canada ricotta gnocchi w/ Cumbrae smoked chicken, grilled zucchini and rich cream; and marinated lamb loin w/ sous vide lamb sausage, celeriac and salsa verde. Nellie had the lobster bisque; fresh linguine w/ roasted peppers, sea asparagus, eggplant caviar and Toscano shavings; and Cumbrae beef tenderloin w/ blue haze, smashed mini reds and Shiitake reduction. Most of us split a bottle of Vineland’s 05 Cabernet; alas, I was driving and couldn’t have much. None of us had room for dessert; in any case it’d grown sweltering hot outside around the second course, so I was ready to head home to some air conditioning and chilled wine. We spent a few minutes on CBJ+M’s deck, drinking the Pinot Grigio we’d picked up at Vineland that afternoon and trying not to wake the other guests with our talk of Gordon Lightfoot and Stan Rogers. The next morning, after another swim, we inhaled Carole’s unbelievable breakfast, featuring sausage and ricotta-stuffed french toast made from a chocolate croissant. Followed by a sticky bun. Even for a guy with an industrial-strength sweet tooth it was pretty rich, but I’d asked for it in a tweet about a month before, so I couldn’t very well back down at the moment of truth. I must say though, my oatmeal this morning was a sad replacement indeed. We had five more wineries to hit, so we said goodbye and went on our way. We stopped at Tawse so they could ooh and aah at both scenery and wine, and then drove up the hill to Megalomaniac for more scenic views and a tour of the cave. We snapped them back into quiet low-key winery mode with a visit to Daniel Lenko (where we snapped up another case), and finished them off with stops at Hidden Bench and Fielding. By this point the trunk was full to bursting; we either had to come home or start carrying boxes on laps. We stopped at Good Earth for some lunch — inside, alas, since the fly epidemic remains. After that it was a pretty uneventful ride back to Toronto, except for the last few kilometres when we drove into yesterday’s miniature monsoon season on the Gardiner. There was standing water being shot every which way by speeding cars, waves crashing over the median…it was nuts. 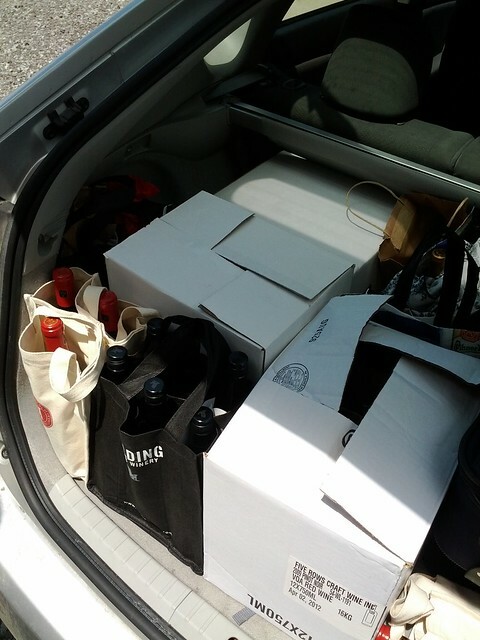 It took us a little longer to drop CBJ+M and unload our wine at home than we’d planned, but that’s the joy of Autoshare. A few clicks of the Android and we had an extra hour. Once we dried off we took stock of the new additions, and set about trying to find them a home in the various fridges and racks. ← "I didn't like the guy before, but I f**king hate him now."